The Boeing 747, commonly called a Jumbo Jet, is among the most recognizable jet airliners and is the largest passenger airliner currently in service. First flown commercially in 1970, it held the size record for more than 35 years until surpassed by the Airbus A380 (due to enter service in 2007). The Soviet-built Antonov An-225 cargo transport remains the world's largest aircraft in service, while the Hughes H-4 Hercules had a larger wing-span. The four-engine 747, produced by Boeing's Commercial Airplane division, uses a two-deck configuration. A typical three-class layout accommodates 416 passengers, while a two-class layout accommodates a maximum of 524 passengers. The hump created by the upper deck has made the 747 a highly recognizable icon of air travel. As of November 2006, 1469 planes have been built with 89 more on order in various 747 configurations, making it a very profitable product for Boeing. The 747-400, the only series currently in production, flies at high-subsonic speeds of mach 0.85 (567 mph or 913 km/h), and features intercontinental range (7260 nm (13446 km)). In some configurations this is sufficient to fly non-stop from New York to Hong Kong — a third of the way around the globe. In 1989, a Qantas 747-400 flew non-stop from London to Sydney, a distance of 11185 miles (18001 kilometres) in 20 hours and 9 minutes, although this was a delivery flight with no passengers or freight aboard. 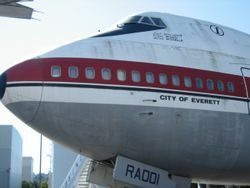 The prototype 747, City of Everett, at the Museum of Flight in Seattle, Washington. The 747 was born from the explosion of air travel in the 1960s. The era of commercial jet transportation, led by the enormous popularity of the Boeing 707, had revolutionized long distance travel and made possible the concept of the " global village." Boeing had already developed a study for a very large fixed-wing aircraft while bidding on a US military contract for a huge cargo plane. Boeing lost the contract to Lockheed's C-5 Galaxy but came under pressure from its most loyal airline customer, Pan Am, to develop a giant passenger plane that would be over twice the size of the 707. In 1966 Boeing proposed a preliminary configuration for the airliner, to be called the 747. Pan Am ordered 25 of the initial 100 series for US$550 million, becoming its launch customer. The original design was a full-length double-decker fuselage. Issues with evacuation routes caused this idea to be scrapped in favour of a wide-body design. At the time, it was widely thought that the 747 would be replaced in the future with an SST ( supersonic transport) design. In a shrewd move, Boeing designed the 747 so that it could easily be adapted to carry freight. Boeing knew that if and when sales of the passenger version dried up (see below regarding the future sales of the 747), the plane could remain in production as a cargo transport. 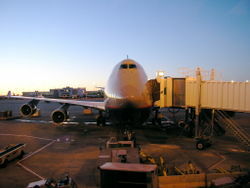 The cockpit was moved to a shortened upper deck so that a nose cone loading door could be included, thus creating the 747's distinctive "bulge". The supersonic transports, including the Concorde and Boeing's never-produced 2707, were not widely adopted, such planes being difficult to operate profitably at a time when fuel prices were soaring, and also there were difficulties of operating such aircraft due to regulations regarding flying supersonic over land. 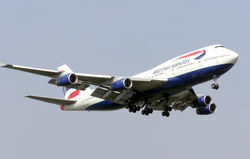 The 747 was expected to become obsolete after sales of 400 units. But the 747 outlived many of its critics' expectations and production passed the 1,000 mark in 1993. The expected slow-down in sales of the passenger version in favour of the freighter model has only been realized in the early 2000s, around 2 decades later than expected. The development of the 747 was a huge undertaking - Boeing did not have a facility large enough to assemble the giant aircraft, so the company built an all-new assembly building near Everett, Washington. The factory is the largest building by volume ever built, on over 780 acres of land. Pratt and Whitney developed a massive high-bypass turbofan engine, the JT9D, which was initially used exclusively with the 747. Four of these engines mounted in pods below the wings power the 747. To appease concerns about the safety and flyability of such a massive aircraft, the 747 was designed with four backup hydraulic systems, split control surfaces, redundant main landing gear, multiple structural redundancy, and sophisticated flaps that allowed it to use standard-length runways. The wing was swept back at an unusually high angle of 37.5 degrees, and it was chosen in order to minimize the wing span, thus allowing the 747 to use existing hangars. During the flight certification period, Boeing built an unusual training device known as "Waddell's Wagon" (named after the 747 test pilot, Jack Waddell) which consisted of a mock-up cockpit mounted on the roof of a truck. It was intended to train pilots on how to taxi the plane from the high upper deck position. Boeing had promised to deliver the 747 to Pan Am by 1970, meaning that it had less than four years to develop, build and test the aircraft. Work progressed at such a breakneck pace that all those who worked on the development of the 747 were given the nickname "The Incredibles". The massive cost of developing the 747 and building the Everett factory meant that Boeing had to borrow, and gambled its very existence on the 747's success; had the project failed, it would have taken the company along with it. Initial problems with the JT9D's development forced Boeing to delay deliveries up to year, and as a result up to 30 planes at one time were left stranded at the Everett plant, with the company on the brink of bankruptcy. The gamble paid dividends, however, and Boeing enjoyed a monopoly in the very large passenger aircraft industry for decades. In fact, the record and benchmark set by the 747 would only be surpassed, more than 35 years after its first delivery, by the A380, built by Boeing's rival, Airbus. On January 15, 1970, First Lady Pat Nixon officially christened a Pan Am Boeing 747 at Washington Dulles International Airport in the presence of Pan Am chairman Najeeb Halaby. Red, white, and blue water was sprayed on the aircraft, rather than breaking a bottle of champagne. The first commercial flight involving the Boeing 747 took place on January 22, 1970 operated by Pan Am between New York's John F. Kennedy International Airport and London Heathrow Airport. Pan Am added 747 service to London from Boston, Washington, and other cities during the spring and summer of 1970. Overnight, a new standard of air travel had been created and other airlines rushed to bring their own 747 jets into service. TWA, Japan Airlines, Lufthansa, BOAC, and Northwest Orient would be among the first carriers to offer 747 service on long-haul flights. American Airlines initiated 747 service between New York and Los Angeles by the summer of 1970. Initially, many airlines regarded the 747 with skepticism. McDonnell Douglas and Lockheed, were working on wide-body three-engine " tri-jets", which were significantly smaller than the proposed 747. Many airlines believed the 747 would prove too large for an average long distance flight, investing instead in tri-jets. There were also concerns that the 747 would not be compatible with existing airport infrastructure, similar concerns that the Airbus A380 currently faces, however compounded even more due to its double-decker feature. Another issue raised by the airlines was fuel efficiency. A three-engine airliner generally burns less fuel per flight than a four-engine, and with airlines trying to lower costs, fuel efficiency was an important issue that would briefly return to haunt Boeing in the 1970s. Many of the airlines' fears came to bear in the 1970s. The Arab oil crisis and economic stagnation in the United States lowered the number of airline passengers and made it difficult for airlines to fill their new 747s. American Airlines replaced coach seats on its 747s with piano bars in an attempt to attract more customers: eventually, it relegated its 747s to cargo service and then sold them. Continental Airlines also removed its 747s from service after several years. The advent of smaller, more efficient widebodies, starting with the trijet DC-10 and L-1011 and followed by the twinjet 767 and A300, took away much of the 747's original market, especially as airline deregulation made point-to-point international service more common. Other airlines that have removed 747s from their fleet include Air Canada, Aer Lingus, Avianca, SAS, TAP, America West, and Olympic Airways. However, many international airlines continued to use the 747 on their busiest routes. The type remained popular among Asian airlines for short and medium-range flights between major cities: in Japan, domestic airlines continue to pack 747s to their maximum passenger capacity. Elsewhere, 747s remain popular on long-range trunk routes, such as transoceanic flights and the Kangaroo routes between Europe and Oceania. The largest fleet of 747s today belongs to Japan Airlines, at approximately 78 (series -200s, -300s and 44 -400s). British Airways has the next largest fleet of 747s, comprising 56 747-400s. United Airlines 747-400 parked at Denver International Airport. Many different stretching schemes for the 747 have been proposed, but the only design to be adopted is 2005's 747-8. 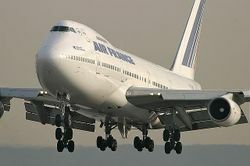 The 747-X program was launched in 1996 as Boeing's response to the Airbus A3XX proposal. The 747-X would have consisted of the 747-500X and 747-600X, seating up to 800 passengers. General Electric and P&W formed the Engine Alliance and designed the GP7200 turbofan to power the Airbus A380. This engine was rumored to also have been planned to power the 747-X. Airlines, however, would have preferred Boeing to develop an all-new design instead of an updated 747, and the plan was dropped after a few months. After development of the Airbus A380 formally began in 2000, Boeing reexamined its 747-X studies but instead devoted its energies to the Sonic Cruiser, and then later on the 787 after the Sonic Cruiser program was put on hold for an undefined period. Some of the ideas developed for the 747-X were, however, used in the production of the 747-400ER. In early 2004, Boeing rolled out tentative plans for what it called the 747 Advanced. Similar in nature to the 747-X plans, the stretched 747 Advanced uses advanced technology from the 787 to modernize the design and its systems. On November 14, 2005, Boeing announced it was launching the 747 Advanced as the 747-8. Eventually, the 747 (in all forms) may be replaced by a clean-sheet aircraft dubbed " Y3". There are five variants of the 747 and launched on five separate occasions. The 747-100 was the original and launched in 1966. The 747-200 was the second model and followed soon after with an order in 1968. The 747-300 was launched in 1980. The 747-400 was launched in 1985, and the last, the 747-8 was launched in 2005. Although there are a total of five models, numerous versions of each type have been produced. Many of these variants were in production at the same time, especially in the 1980's. However, only the 747-400 has been in production since. The first model of the jet, the 747-100, rolled out of the new Everett facility on 2 September 1968. The prototype, named City of Everett, first flew on February 9, 1969, and on January 22, 1970 the 747-100 entered service with launch customer Pan American World Airways on the New York-London route. The flight was supposed to occur on January 21, but engine overheating made the original plane unusable and it had to be substituted, creating a more than 6-hour delay. The basic 100 has a range of about 4500 mi (7242 km) with full load. The US military designation for 747-100 is C-19. The very first 747-100s off the line were built with six (3 per side) upper-deck windows to accommodate upstairs lounge areas. A little later, as airlines began to use the upper-deck for premium passenger seating instead of lounge space, Boeing offered a ten window upper deck as an option, and it quickly became the standard. Some 100s were even retrofitted with the new configuration. With a MTOW of 735,000 lb compared to the 833,000 lb of the 747-200, no freighter model of this aircraft was offered directly by Boeing. However, upon airline retirement, many 747-100s have been converted to freighters over the years. Their cheap acquisition costs more than compensate for lack of carrying capacity. They are also ideal for parcels since volume is paramount to weight. A 747-100, registered N905NA, is operated by NASA as a Shuttle Carrier Aircraft. It was acquired in 1974 from American Airlines. A 747-100 is owned by General Electric and used as a testbed for their engines. Total production was 250. Of these, 167 were 747-100, 45 were SP, 29 were SR, and 9 were 100B. The 747-100 was later superseded by the 747-100B, which has a stronger airframe and undercarriage design. This increased maximum take-off weight to 750000 lb av (340194 kg). The 747-100B was only delivered to Iran Air and Saudia (now Saudi Arabian Airlines). With requests from Japanese airlines, Boeing developed the 747SR as a 'Short Range' variant of the 747-100. The SR has a lower fuel capacity, but can carry more passengers - up to 498 passengers in early versions and more than 550 passengers in later models. The 747SR has a modified body structure to accommodate the added stress accumulated from a greater number of take-offs and landings. Later on, short range versions were developed also of the -100B and the -300. The SR aircraft are primarily used on domestic flights in Japan. Two 747-100B/SRs were delivered to Japan Airlines (JAL) with a stretched upper deck to accommodate more passengers. This is known as the "SUD" (stretched upper deck) modification. All Nippon Airways (ANA) operated 747SR on domestic Japanese routes with 455-456 seats but retired the aircraft on 10 March 2006. JAL operates its 747-100B/SR/SUD aircraft with 563 seats on domestic routes and plans for retirement in the third quarter of 2006. JAL and JALways have also been operating the -300SRs on domestic leisure routes and to other parts of Asia. One ex-JAL 747-100SR, registered N911NA, is operated by NASA as a Shuttle Carrier Aircraft. It was added in 1988 and first carried a shuttle in 1991. With the arrival of the much more economical Boeing 777-300, the SRs are now being replaced, with just a very few still in operation. In August 2006 a total of 38 Boeing 747-100 aircraft (all versions) were in airline service with Iran Air (1), Japan Airlines (1), Orient Thai Airlines (2), Saudi Arabian Airlines (7), Evergreen International Airlines (6), Kalitta Air (6), Polar Air Cargo (1) and United Parcel Service (7). The 747SP was a shortened version of the 747-100. It was introduced into service in 1976 with Pan AM. Apart from the upcoming 747-8 the SP is the only 747 with a modified length fuselage. It was designed to fly higher, faster, and longer than the 747-100. Boeing hoped that the abilities of the SP would compete and take orders from the Douglas DC-10 and create a niche market, however in the end only a total of 45 were built. 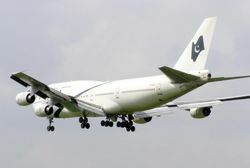 As at August 2006 a total of 13 Boeing 747SP aircraft were in airline service with South African Airways (1), Iran Air (1), Iraqi Airways (2), Kinshasa Airways (1), Palace Air (1), Saudi Arabian Airlines (1), Syrian Arab Airlines (2) and Transatlantic International Airlines (2). Entering service in 1971, and further improved over successive years, the 747-200 had more powerful engines and higher takeoff weights than the -100, allowing it to fly farther. A few early build -200s retained the three window configuration of the -100, but most were built with a ten window per side configuration. As on the -100, a stretched upper deck (SUD) modification was offered much later. KLM remains the only airline to retrofit their -200s with the SUD option. Today, many -200s are still in passenger operation, though retirement and conversion to freighters has accelerated as of late. The 747-200B is an improved version of the 747-200, with increased fuel capacity and more powerful engines. It comes in a combi version as well. The 200B were built in the late 1980s and have a full load range of about 6700 mi (10783 km). The US military designation for 747-200B is C-25. The USAF only operates two C-25, in VIP configuration ( VC-25A). These two aircraft, tail numbers 28000 and 29000 are known by the call sign Air Force One when the US President is onboard. 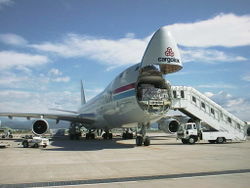 The 747-200C Convertible is essentially a passenger aircraft that can be converted to a freighter and back when needed. The seats are removable and the fuselage has a much bigger door on the maindeck for cargo entry. The 200C could be fitted with a nose door. This type can carry both freight and passengers, but unlike the 200C, it can do so at the same time. A wall half way through the main deck, separates the cargo in the back from passengers on the front. This type carries cargo throughout the lower deck, and on half the maindeck, along with roughly 200 passengers. Also known as the 747-200 Combi. This is a freighter version of the -200 model. It could be fitted with or without the nose door. It has a 105ton capacity and a MTOW of 833,000 lb. It entered service in 1972 with Lufthansa. Total production was 393. Of these, 225 were 747-200, 78 were M, 73 were F, 13 were C, and 4 were military. In August 2006 a total of 239 Boeing 747-200 aircraft (all versions) were in airline service. Major operators include: Japan Airlines (13), Nippon Cargo Airlines (10), Air Atlanta Icelandic (15), Air France (9), Atlas Air (16), Kalitta Air (13), Northwest Airlines (28) and Southern Air (9). Some 41 other airlines operate smaller numbers of the type. With the poor reception of the 747SP due to higher trip costs compared to the DC-10 and Lockheed L-1011 Boeing decided on offering a trijet version of the SP. The plane would have been bigger than either of the two, with more payload, range, and passenger capacity, but it received a cold reception and was never launched. Another option was to go bigger and extend the upperdeck all the way back for seating around 600, however this was also dropped. The 747-300 name was revived for a new aircraft, which was introduced in 1980. This was the first 747 model to feature a "stretched upper deck", which was 23 ft 4 in longer than earlier variants. The 300 also had a straight staircase for the upper deck rather then the spiral, and this created more room both below and above for more seats. With minor aerodynamic changes, Boeing increased the cruise speed of the 300 to Mach 0.85 from Mach 0.84 on the 100/200. Also, with improved fuelburn, range improved to 7700mi (12,392 km). Swissair was the launch customer for the 747-300, however, the first plane was delivered to French airline UTA on March 1, 1983. The impressive wing span of a Boeing 747-300 series. 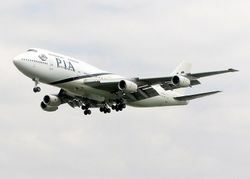 This is an aircraft of PIA landing at London Heathrow Airport. Boeing never launched a 747-300F as it had no operating advantage over the 747-200F. The most significant change between the 747-300 and the 747-200 was the stretched upperdeck which was useless in freighter configuration as no cargo is placed on this deck. Despite the improvements of the -300, only 81 aircraft were ordered, 56 for full passenger use, 21 M and 4 SR. One factor for the low sales was the launching of the 747-400 in 1985 (just 2 years since the -300 entered service) and the subsequent wait of the airlines for a much more advanced product. Today, most of the -300 versions are still in passenger operation, mostly in south and west Asia. The 300M had similar cargo capacity as the 200M, however with the stretched upperdeck it could carry more passengers. This proved popular in the fleet of KLM on their Africa routes that had few passengers, yet considerable air freight. The Japanese airlines again asked for a high capacity domestic model and Boeing offered the SR. JAL operated such aircraft with over 500 seats on Okinawa-Tokyo route as well as others. Airlines currently (at August 2006) operating the Boeing 747-300 include JAL/ JALways (12), Saudi Arabian Airlines (9), Pakistan International Airlines (PIA) (6), Qantas (6), and Air Atlanta Icelandic (6). Some 16 other airlines operate smaller numbers of the type and a total of 72 Boeing 747-300 aircraft (all versions) were in airline service. British Airways 747-400 landing at London Heathrow Airport. The 747-400 is the latest model of the 747 and the only series still in production. It is offered in several versions discussed on the main page article. It added 6 ft (1.8 m) wing tip extensions and 6 ft (1.8 m) winglets, tail fuel tanks, revised engines, an all-new interior, and an all-new glass cockpit which dispensed with the need for a flight engineer. The passenger version first entered service in February 1989 with Northwest Airlines on the Minneapolis to Phoenix route. The combi version entered service in September 1989 with KLM. The freighter version entered service in November 1993 with Cargolux. In August 2006 a total of 627 Boeing 747-400 aircraft (all versions) were in airline service, with 46 further firm orders. major operators include: Air China (12), Air India (12), All Nippon Airways (23), Asiana Airlines (14), Cathay Pacific (30, plus 6 on order), China Airlines (34, plus 2 on order), EVA Air (18), Japan Airlines (44), Korean Air (43), Malaysia Airlines (19), Qantas (30), Singapore Airlines (27), Singapore Airlines Cargo (15), Thai Airways International (18), Air France (21), British Airways (57), Cargolux (14, plus 2 on order), KLM Royal Dutch Airlines (25, plus 1 on order), Lufthansa (30), Virgin Atlantic Airways (13), Atlas Air (11), Northwest Airlines (16) and United Airlines (31). Some 24 airlines also operate the type, but in smaller numbers. Three used Boeing 747-400 passenger aircraft are to be converted into an outsize configuration, in order to ferry Boeing 787 sub-assemblies to Everett, Washington for final assembly. 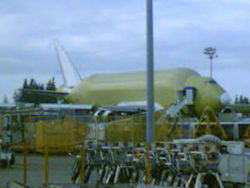 The first 747 LCF flew for the first time, unpainted, on September 9, 2006. The LCF is not a Boeing model and will not be sold to any customers or see any airliner operation. Boeing announced a new 747 model, the 747-8 (referred to as the 747 Advanced prior to launch) on November 14, 2005, which will use same engine and cockpit technology as the 787 (It was decided to call it the 747-8 because of the technology it will share with the 787 Dreamliner). Boeing claims that the new design will be quieter, more economical and more environmentally friendly. The passenger version (dubbed 747-8 Intercontinental) will be capable of carrying up to 467 passengers in a 3-class configuration and fly over 8000 nm (14816 km) at mach 0.86 (1054 km/h). As a derivative of the already common 747-400, the 747-8 has the economic benefit of similar training and interchangeable parts. The 747-8I is also streched to add more capacity/payload. It's streched from 70.8 to 76.4 meters. In October 2006 there was a total of 3 firm orders for the Boeing 747-8I aircraft from VIP customers. In November 2006 there was an additional firm order for the Boeing 747-8I aircraft for a VIP transport. 747-8F Boeing also announced a new freighter model, to be a derivate to the 747-400ERF. It's also a competitor to the A380-800F, which has 20 orders to date. The 747-8F is a 76.4 meters long plane, which provides capacity of 132 tons of cargo, one of the great features is the forward (overhead) nose-door. It has also the same engines as the 747-8I and 787. There are wing changes and there is a new cockpit. In October 2006 there was a total of 44 firm orders for the Boeing 747-8F aircraft from Nippon Cargo Airlines (8), Cargolux (10), Emirates air cargo (10) and two undisclosed. The US military designation for 747-400 is C-33, intended to augment the C-17 fleet, but the plan was cancelled in favour of purchasing additional C-17 military transports. 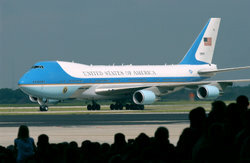 The current U.S. presidential aircraft, two 747's tail numbered 28000 and 29000 with Air Force designation VC-25A, are among the most famous 747 models. They are popularly known as Air Force One, although that name is technically the call sign for any United States Air Force aircraft carrying the President. Both VC-25As are based on the civilian 747-200B, though they contain many of the innovations introduced on the 747-400 (such as an updated flight deck and engines). Other special 747s include the E-4B Formerly known as National Emergency Airborne Command Post (referred to colloquially as "Kneecap"), now referred to as National Airborne Operational Command (NAOC), modified 747s to transport the Space Shuttle ( Shuttle Carrier Aircraft), and aerial refueling tankers. A recent addition to the military's 747 arsenal is the experimental Airborne Laser, a component of the National Missile Defense plan. T/Space is also planning to use a 747 for its CXV space capsule proposal. 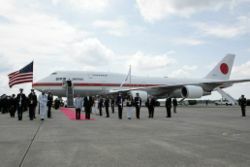 A number of other governments also use the 747 as a VIP transport, including Bahrain, Brunei, India, Iran, Japan, Oman, Qatar, Saudi Arabia, and United Arab Emirates. Recently, several new Boeing 747-8 have been ordered by Boeing Business Jet for conversion as VIP Transport for several unidentified customers. The first crash of a 747 took place in November of 1974 when Lufthansa Flight 540 crashed in Nairobi killing 59 people. The Tenerife disaster on March 27, 1977 claimed a total of 583 lives when two 747s collided in heavy fog at Los Rodeos Airport, making it the highest death toll of any accident in aviation history. An Air India Flight 855 Boeing 747 crashed into the sea off the coast of Mumbai (Bombay) on New Year's Day, 1978. All passengers and crew were killed. Many residents of sea-front houses in Mumbai were witness to the incident. On August 12, 1985, the Japan Airlines Flight 123 (a 747SR) lost control and crashed, causing 520 fatalities and is currently the worst single-aircraft disaster in aviation history. The Lockerbie bombing was a Pan Am 747-100. Air India Flight 182 was a 747-237B that exploded on June 23, 1985. All 329 on board were killed. Up until September 11, 2001, the Air India bombing was the single deadliest terrorist attack involving aircraft. Korean Air Lines Flight 007 was a 747-230B which was shot down by the Soviet Air Force on September 1, 1983. All 269 passengers and crew aboard were killed. El Al Flight 1862 was a 747-200F which crashed shorly after take-off from Amsterdam Schiphol on October 4, 1992. Engines no. 3 and 4 detached shortly after take-off and as a result the flight crew lost control and the crippled 747 crashed into the Klein-Kluitberg apartments in Bijlmermeer at high speeds. All 3 crew were killed as well as 43 on the ground. China Airlines Flight 611, a 747-209B, broke-up mid flight on May 25, 2002, en route to Hong Kong International Airport, Hong Kong from Chiang Kai Shek International Airport in Taipei, Taiwan. All passengers and crew on board lost their lives. 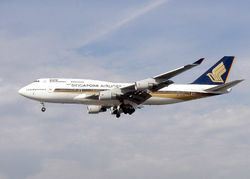 On 31 October 2000, Singapore Airlines Flight 006, a Boeing 747-400 flying on a Singapore to Los Angeles via Taipei route rammed into construction equipment while attempting to take off from a closed runway at Chiang Kai Shek International Airport, caught fire and was destroyed, killing 79 passengers and 3 crew members. The accident prompted the airline to change the flight number of this route from 006 to 030 and to remove the "Tropical Megatop" livery on the accident aircraft's sister ship. Despite all these, very few crashes have been attributed to design flaws of the 747. The Tenerife disaster was a result of pilot error, ATC error and communications failure, while Japan Airlines Flight 123 the consequence of improper aircraft repair. United Airlines Flight 811, which suffered an explosive decompression mid-flight on February 24, 1989, subsequently had NTSB issuing a recommendation to have all similar 747-200 cargo doors modified. TWA Flight 800, a 747-100 that exploded mid-air on July 17, 1996, led to the Federal Aviation Administration proposing a rule requiring the installation of an inerting system in the centre fuel tank for most large aircraft. As of May 2006, there were a total of 44 hull-loss occurrences involving 747s, with 3707 fatalities. A 747-400 has six million parts (half of which are fasteners) made in 33 countries. Just one engine on a 747 produces more thrust than all four engines on an early model Boeing 707 combined. 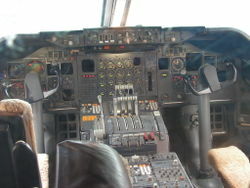 As with other airliners such as the DC-10, the engines on a 747 are not visible from the cockpit windows. This configuration has had significance during various accidents and incidents involving this aircraft. When pressurized, a 747 fuselage holds over a ton of air. Early model 747s have more than 700 lb (300 kg) of depleted uranium molded into the engine nacelles. Its purpose is as ballast to prevent the wing from fluttering. At the time of its launch, the term "jumbo jet" had already been coined by the media to describe a general class of new wide-bodied airliners then being developed, including the Lockheed L-1011 TriStar and McDonnell Douglas DC-10. Boeing was keen to discourage the media and the public from using the term "jumbo jet" for the 747, but their efforts were in vain and now the term is synonymous with the 747. Because of its length, there is a small flexure of the fuselage in flight. This effect was not anticipated in the design of the autopilot on early models, and so there is a very slow oscillation in yaw when flying on autopilot. This was first discovered on an overseas flight to the Paris Airshow, when some of the people in the rear became air sick. Upon return, the plane went through tests to solve the problem and adjust the yaw damper system. The effect is now too small to be noticeable by passengers. To enable easy transportation of spare engines between sites by airlines, early 747s include the ability to attach a non functioning fifth-pod engine under the port wing of the aircraft, between the nearest functioning engine and the fuselage. Photographs of planes flying in this configuration are highly prized by aircraft enthusiasts. Although the upper deck might seem small compared to the size of the whole aircraft, it can seat a significant number of people: JAL has 86 seats on the upper deck of its 747-400D aircraft. The 747 is certified to fly on 3 of its 4 engines. A 747 can successfully take-off even if an engine fails after rotation, and in many cases the flight can continue to its destination. On 24 May 1991 an El Al Boeing 747 airlifted a record-breaking 1,087 passengers - Ethiopian Jews flying from Addis Ababa to Israel as part of Operation Solomon. The passenger count became 1,088 when a baby was born in-flight. In December 2004, a special Boeing 747-400 (B-18210) was delivered to China Airlines. It is nicknamed "747 Dreamliner". Its livery is a combination of Boeing's corporate livery on the fuselage and China Airlines's plum blossoom on the tail. It is one of two non-retrofitted non-747-400ERs to feature Boeing's Signature Interior from the Boeing 777 (the other being B-18211, also delivered to China Airlines). There are other aircraft with prominent humps on the upper fuselage including the Carvair, which was built from 1961 to 1969, which appeared in the 1964 James Bond movie Goldfinger. The 747 has appeared as a setting for a number of films, including Airport 1975, Snakes on a Plane, Air Force One, Turbulence and Executive Decision.